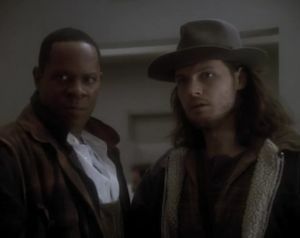 Sisko is forced to take on the role of historical terrorist and icon Gabriel Bell as Kira and O'Brien work to rescue their comrades from the 21st Century. This two-parter has all the right ingredients for a good DS9 story full of provocative questions and moral ambiguity. It sticks to a tried-and-true Star Trek formula, using time travel as a way to comment on socio-political issues like poverty, social justice, and economic inequality. It also has a solid theme about how one person turning away from the plight of another is indicative of a society in a state of decline. However, the theme gets ridiculously anvilicious by the end and any notion of nuance or understanding of the situation the writers have created is washed away in the rush to preach to the audience again and again. There's also the questionable underlying premise that terrorism is an effective and acceptable vehicle for social change. TNG handled this notion much more efficiently and responsibly in the (admittedly weaker) episode "The High Ground," when Picard admits to Data that terrorism's effectiveness is a deeply uncomfortable reality but one which must be confronted on moral grounds. DS9 could have addressed this more directly and moved the debate forward, but completely glosses over the problem by focusing instead on the inattentiveness of society. Sisko comes close to acknowledging in the first half that there are unfortunate realities that lead to social inequality, but the episode never actually outlines any of those realities--aside from the turning away it mentions about 783 times--which is unforgiveable for a show that prides itself on narrative complexity. It almost feels like a DS9 episode that was written by a TNG writer with an axe to grind. According to Memory Alpha, "Past Tense" is often critiqued as being "too liberal" in its political tone, but I fail to understand how the issues shown relate to the left-right spectrum of American politics. Sure, economic inequality is a bigger obsession for the left than the right, but this story never once explains what kind of political policies lead to the extreme disparities of its dystopic near future. It's a surprisingly prescient bit of sci-fi that rings terrifyingly plausible from the perspective of somebody in 2013, but if you look at the situation America finds itself in today, both the left and the right acknowledge the problem and have convincing arguments for how the other side is largely to blame. If you ask me, we run the risk of realizing "Past Tense" not because we have slavishly committed to conservative or liberal economic policies, but because we are so gung-ho on confirming our biases and assigning blame that we aren't actually fixing anything. This is hardly a "liberal" perspective, and yet nothing in this episode contradicts it. I do take issue, however, with the storytelling itself. The main plot involving Sisko and Bashir is well-developed, but the side stories struggle to find a purpose. Dax is a fifth wheel who's presence only solves totally contrived obstacles, even though her story could easily address the other side of the thematic coin. Even worse is the O'Brien/Kira subplot, which develops a nonsensical set of problems and pays them off in a series of goofy sight gags involving historical stereotypes and a deus ex machina-style final minute plot solution. I addressed the question of why the timeline waits to change in the future--something that doesn't make any sense--but it's even worse than that. Why do Sisko, Dax, and Bashir have to wait anxiously for O'Brien and Kira to race against the clock to save them? If O'Brien and Kira are traveling to the same moment in time that Sisko's team did, how come they don't show up for several days? I know I get extra nitpicky about time travel, but seriously, it makes no sense! The past isn't moving forward alongside the present, because it's in the goddamn past. Unless there is a specific reason why your time machine will only travel a set amount of time (which there isn't in this episode), if you want to travel back to August 2nd but it will take you ten days to perfect your time machine, that doesn't mean you'll have to settle for August 12; you can still travel to August 2nd, because you have a machine that travels through time. Don't get me wrong. I actually enjoy "Past Tense," despite my heavy critiques. I guess I'm being so hard on it because I can see how it could be even better, but perhaps I should console myself with the knowledge that this two-parter is demonstrating where DS9 can improve going forward.